Fortune Is Everywhere, Seize It! I used to have an entire drawer full of fortune cookies. 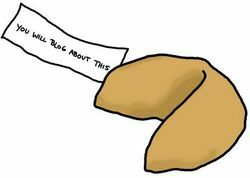 At the end of each meal I’d open exactly one fortune cookie and shelve the rest. I suppose I was saving them for a rainy day—some day when I needed a pick-me-up or when I could to hand them en mass to other people. I always planned to use them but as the days and weeks and months went by, I never did and by 2010’s December the drawer which had once been shared with silverware, decks of cards, pencils, and odds and ends had now been completely taken over by a river of little oriental treats. I suppose you could say I was in a pretty dark place at the time too. My girlfriend and I were in the middle of breaking up, I was constantly working overtime at a job I didn’t care for, and I was about to face my third Christmas Eve alone. I had turned down a friend’s invitation to spend the holidays in Palm Springs that year. I’d never really felt comfortable around other people’s families anyway, especially families I didn’t know, and even more so around the holidays. Now perhaps it was the bourbon or perhaps I was… looking for something, but that fortune struck me in a way I can’t put into words. It simply was exactly the right thing to read at exactly the right time to read it. Here I was all down on myself and yet this was an incredibly unique situation— it could only come around once a year, right? And what I realized was that this situation was precisely my own making: I had literally chosen to be alone, and was choosing to be unhappy about that choice. I sat back a moment to contemplate this. Yeah, I did actually have a reputation for being straight, forward, and honest. In fact I’m often forward and honest to a fault. So I kept going. 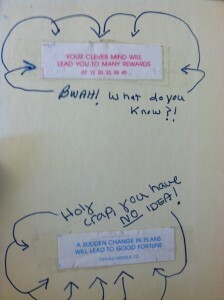 I tore into my drawer and began reading every fortune I had. I taped them all around—to the inside of my journal, onto my computer, I covered mirrors and doorways, I even placed some in my car. Here’s the thing: Yes, these are just silly little sayings printed en mass on little bits of paper that are fun to read but arrive entirely by chance. It’s entirely up to us to decide their significance: we can either toss them in the trash or to give them value. And value, in this case, is exclusively up to our appraisal! This is the challenge life presents us every day—give it meaning or throw it out. What if a little pretending was just enough to make a positive difference? Loving yourself means making use of every bit of fortune you’re given. It doesn’t matter what you think you deserve, who you think you are. No matter how it got to you, fortune is there for you to do with it as you choose. You have to seize from every moment its unique fortune. Every moment has it, it’s up to you to make use of it. It can be anything you want it to be and it becomes fortune immediately upon your conscious decision to call it such. That night I called my friend and asked if her invitation was still good to have me over for Christmas. To my relief, she said I was still welcome and I made the 3-hour drive to Palm Springs and ended up having one of the most enjoyable Christmases I’d had in years. The opportunity had been right in front of me the whole time, all I had to do was reach out and grab it. And that has made all the difference. So my challenge to you is to use this moment to find the fortune that life is giving you. Maybe it’s a song on the radio, maybe it’s a goofy picture on the wall, or a random passing comment you hear on the street but every moment has fortune and I do mean every one. Find it. Use it. Tell the world.